We live in a mobile first world, with all major and small-scale websites doing their best to keep their onsite pages optimised for mobile devices. But what happens when the latest SEO buzz is all about Accelerated Mobile Pages (AMPs)? AMPs is an open-source project designed to help web designers create a better user experience on mobile devices. Content should be able to load instantly across all devices for a smooth user experience and uninterrupted online journey. Around 53% of mobile site visits are abandoned if pages take longer than 3 seconds to load, meaning a slower website equals a loss in sales. MP HTML – pre-processing tags. These are mainly limited to text formatting and image embedding tags. AMP Cache – Google’s servers can lift and grab content from cached HTML pages. 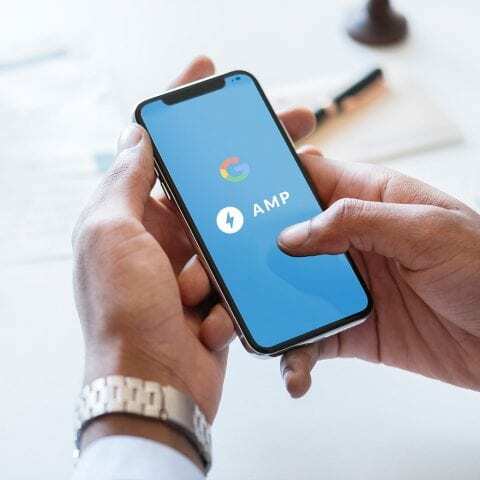 For the past year, Google has been integrating these AMP listings into mobile search results which appear with a special AMP designation, so they can easily stand out. AMPs are becoming more important for SEO as page speed and mobile-readiness aid towards high quality rankings and determine your site’s position on search engine results. With Google potentially launching their mobile-first index next year, mobile performance is bound to become increasingly more important. This means online businesses must prepare their sites to be optimised for all devices. Faster loading content is king when it comes to forming a positive business/consumer online relationship, as it can contribute towards providing a superior user experience online. The burning question here is, how will AMPs affect web designers? The official project presents web designers with a set of design principles, listing all the things they can and can’t include on web pages. The golden rule? Always prioritise the end user experience. This includes focusing primarily on aspects which can be implemented to load fast, as excellent speed remains at the core of AMPs. Each page must be specially formatted, complying with Google’s standards. Whilst AMPs certainly have advantages from a UX perspective and might even contribute towards your organic rankings, as well as providing optimised landing pages for search ads, due to some of the limitations that have to be taken into account this can be restrictive for the creative web design process. If you’d like to learn more about how AMPs can come into play for your online business, say [email protected] or give us a call on 0116 326 0090.